: : : Cabaret 54 : : : Liza Minnelli Discography - Liza! Liza! 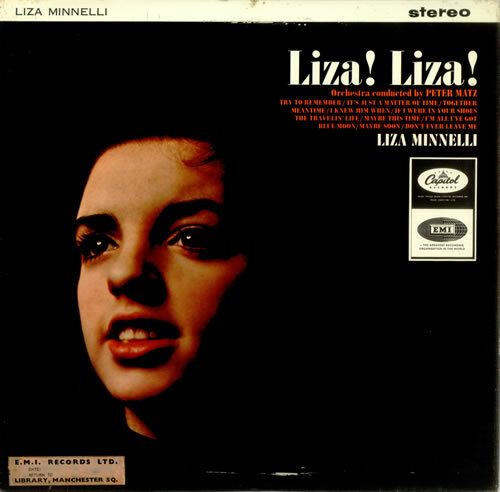 This page is devoted to Liza Minnelli's first album, Liza! Liza! After the prior successes the previous year of Liza's singles "You Are For Loving", "One Summer Love", and "Day Dreaming", Capitol Records committed to signing Liza for an entire album. When Capitol released the album, they were so uncertain about the public's reaction to their new vocalist that all their advertisements trotted out the girl's artistic pedigree, dragging parents Judy Garland and Vincente Minnelli into the packaged product by proxy. Produced by Si Rady and orchestrally arranged & conducted by Peter Matz, the album was recorded in June of 1964, then released that October 5. (It would later be re-issed under the title Maybe This Time, and first released in Britain under this title in 1973.) The album made it to position 115 in the Billboard 200 charts. It peaked on November 21, 1964 (also the birthday of her younger sister, Lorna Luft), and maintained for the following 8 weeks. Reportedly, the LP sold out its first pressing in two weeks. The album was received exceptionally well for the work of a teenager, and received glowing reviews. The album featured two Kander-Ebb songs (the start of a career-long association with this songwriting team); one was "If I Were In Your Shoes", the other was "Maybe This Time" - a number initially written for Kaye Ballard's nightclub act, but became permanently associated with Liza after being included in Cabaret; Liza's first major screen triumph almost eight years later. The disc also included a song by Marvin Hamlisch, "The Travelin' Life". The vocal similarities between mother and daughter is particularly striking on this track; the emotional intensity in the voice, the phrasing, the power (even if not perhaps the level of Judy's at her most robust), and the occasionally hard to control theatrical talent - if not a hint of Judy's lisp. The comparisons between the two would continue onwards for the entirety of Liza's career, as it still does to this day, much to her chagrin. The album allegedly sold half a million copies within a two or three year period, by the end of 1966 or 1967, but it has not been certified Gold to date. This success led to Liza signing a new contract with Herb Alpert's A&M Records label.